The title of this book really says it all. 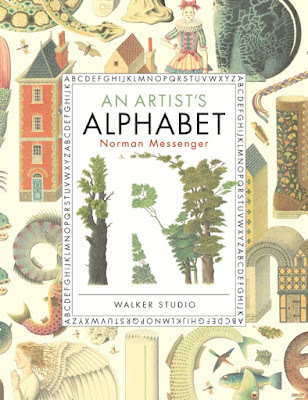 This is an artist's alphabet; each page is beautiful enough to be framed and hung as a print. I love the illustration style and muted pallette. I really appreciate having both upper and lower case characters side by side on each page, and the typography is suitably elegant. The matte hardback jacket only accentuates this book's coffee-table-worthiness. This is not a first-grade-teacher's alphabet, or a phonologist's alphabet; letters are always represented artistically but not obviously phonetically. So the shape of the letter "R" on the cover is exquisite -- having negative space serving as a character's shape. But do trees, forest, grove, woodland or even negative space start with R? Nope. Perhaps "Regal rupture" is the answer for R? Sure. That'll work. You can knock your socks of creatively coming up with appropriate phonetic matches for the pages where a relationship isn't immediately apparent (or even after a minute or two, apparent). In a few cases there is an easily-identified correspondence (e.g. the acrobats, laces, houses and beetles/bugs), but the unconventional pages will likely generate more discussion! The book is much better suited to an art classroom display area than a new-entrant classroom. Junior art classes (or seniors during a warm-up first term) tasked with creating artistic glyphs would surely draw great inspiration from it. Hokusai-esque curling waves for C? Gorgeous. Great to prop open on a little easel and talk about. Accustomed to a standard abecediary format, I suspect some early readers will be stumped by some and even potentially frustrated by the cleverness of it all. So are you an artist? Do you love visual puzzles? Does the cover alone make you swoon? This is an artist's alphabet indeed -- does it call to you?